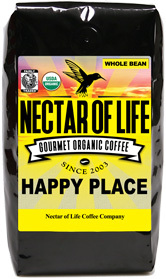 Nectar Shot - Gourmet Fair Trade Organic Espresso Coffee Blend. Roaster's Notes: Extremely complex espresso with notes of dark chocolate, berry and stone fruit. WARNING! This espresso blend is not for the faint of heart. This is a dark roasted monster consisting of coffees from Africa, Indonesia and South America (proprietary blend, won't tell, sorry!). Sure this blend will make fabulous lattes, iced coffees, etc., but it is truly for the espresso connoisseur, who knows how to prepare and enjoy straight espresso. This blend is (in our opinion) the best espresso coffee period! It is extremely smooth and finishes with a wild berry note that evolves on the palate for days. Trust me, YOU WON'T BE DISAPPOINTED! 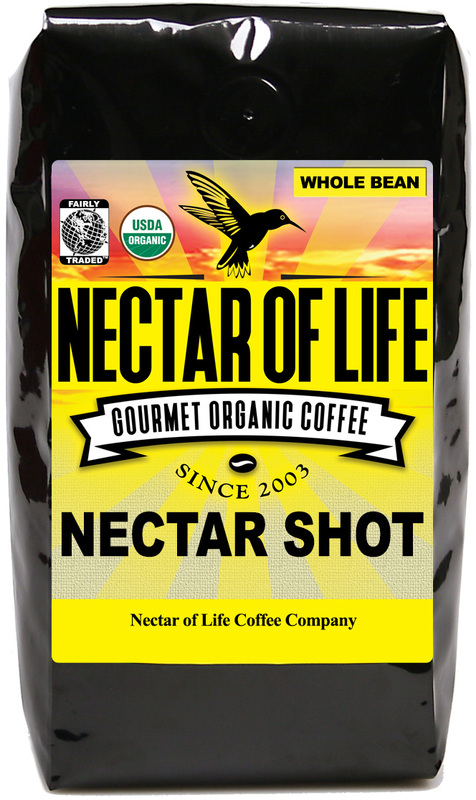 This was my first time trying Nectar Shot and it will now be on my regular rotation of whole beans I use daily in my espresso machine. The flavors are exquisite and an all around wonderful taste. I was thoroughly pleased! Every bag of coffee I order is top quality and full of flavor. it does not last long in my home, everyone loves the Nectar of Life coffee. This has a nice smooth taste up front with nice creama then a little bit at the end. The coffee is excellent and worth it. I want to thank you for your great product and service. We enjoy your coffee and have delighted many friends with delicious lattes, americanos and dopios.